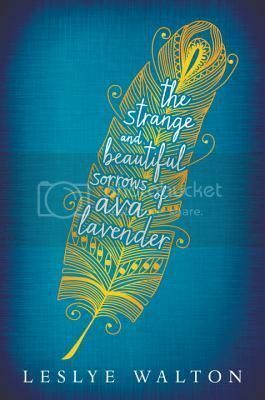 The Strange and Beautiful Sorrows of Ava Lavender by Leslye Walton (review copy) - Foolish love appears to be a Roux family birthright, and for Ava Lavender, a girl born with the wings of a bird, it is key to her inheritance. In a quest to understand her peculiar disposition and a growing desire to join her peers, Ava ventures away from home, ill-prepared for what awaits her in a world that does not know whether to view her as girl or angel. Ava's search and her family's saga build to a devastating crescendo until, on a summer solstice, the skies open up, rain and feathers fill the air, and Ava's fate is revealed. From the blurb. I received this as an unsolicited review copy. It didn't sound like my thing, but with it came a letter from the publisher, raving about how wonderful it was, and imploring that I, the reader, read just the first few pages, just to see. I was due to start a new book, so I thought I'd give the first few pages a go as it was in my hands... and I couldn't put it down. The Strange and Beautiful Sorrows of Ava Lavender is absolutely mesmerising. And I cannot stop thinking about it. On 1st March 1944, a girl is born. Born with wings. This girl was Ava Lavender. Some people were appalled by her. Others fell to their knees in prayer. Her mother, fearing for her safety, keeps her within the boundaries of their home, away from prying eyes and harsh words. But at 16, Ava steps beyond the boundaries, wanting to experience true teenage life among those her own age. But once seen, her life is forever changed. This is the story of Ava's life, and of the women in her family before her, three generations back, a quest to understand why an ordinary girl was born with wings. A quest to understand her fate. Ava Lavender is an absolutely magical tale. Told in it's literary style and requiring you to suspend disbelief - like how, for example, Ava's grandmother Emilienne's youngest sister Pierette turned herself into a canary - it reads like a fairy tale. Strange happenings occur in the lives of the Roux family. Emilienne can read the signs that tell you what is to come - Emilienne knew if a spoon was dropped, it meant someone was coming to visit - Viviane, Ava's mother, had a keen sense of smell, and could even smell emotion, Ava has her wings, and her twin brother Henry, mostly mute, is sensitive to words, to touch, and understands warnings no-one else can hear. As the story unfolds - Emilienne's early life to adulthood, Viviane's too, then the birth, childhood and teenage years - layers are peeled away, like a present in a game of pass-the-parcel. Everyone has a story; Emilienne's parents and three siblings, Ava's father, Gabe the lodger, Fatima Inês de Dores who lived in the Lavender house in the 1800s, everyone. Histories and individual lives; you have whole stories within a story. Each story overlaps or affects someone else's story, all feeling like fate, all leading to a child being born with wings, with certain people around her in certain circumstances. To lead to what can only be called inevitable. And the one thread that touches them all is love. Love that brings only pain. "Love makes us such fools." Ava Lavender, in this way, with the impression of fate and with the strange "gifts" of the various characters, reminded me of The Night Circus by Erin Morgenstern, not in plot but in the sense of the magical, the whimsy that completely captivates you and whisks you away with it's gorgeous, rich story and sumptuous, beautiful language. There is beauty in the strange; there is no "how", but there is beauty in everything, on every page. This book is a wonder, and completely took my breath away. A book I will read over and over, and love forever. A book to be revered and handled as the treasure it is. I am completely bowled over, and no review I could ever write could convey just how much this book, these characters and their stories, have captured my heart and my imagination. I didn't want it to ever end. Absolutely incredible debut. Beautiful. I absolutely cannot wait for what Walton shares with us next. Thank you to Walker for the review copy. This sounds brilliant - it didn't originally sound like my kind of thing either but I think I'll be picking this up off the pile soon! I adored this book to the very last page, and although I'm not quite sure how Ava got her wings back in the end, I wouldn't change a thing about this book.